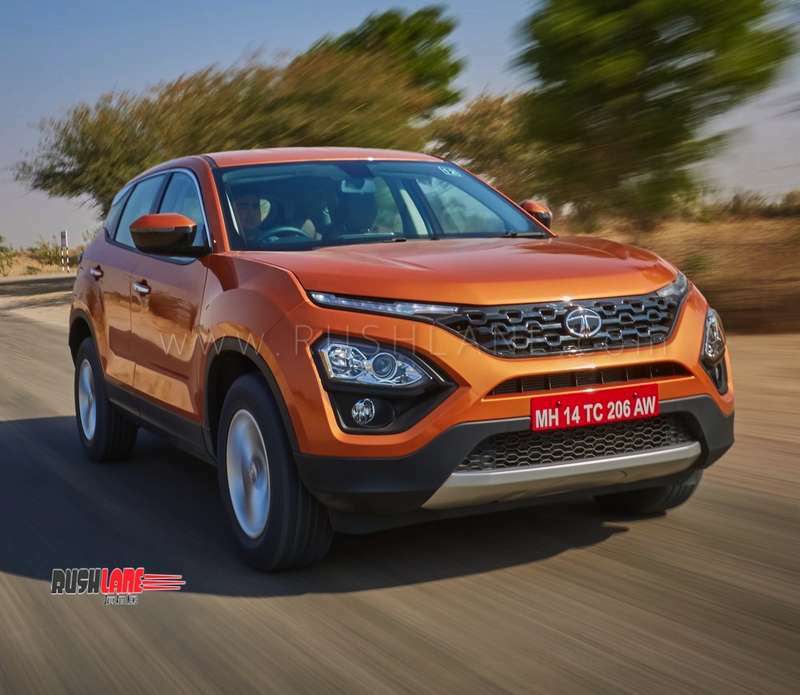 Tata Harrier review test drive - Is it better SUV than Mahindra XUV500? Ever since it was unveiled for the first time as H5X concept model at 2018 Delhi Auto Expo, Tata Harrier has remained one of the most talked about upcoming SUVs in the country. 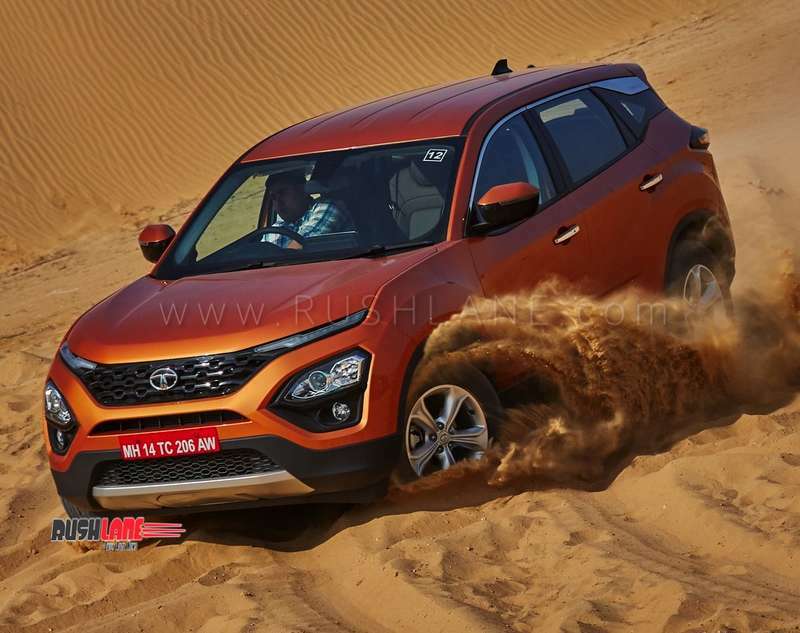 Harrier will be launched in early 2019 and ahead of that, we got the chance to test drive the car in Jodhpur recently. Not only its an all new car, it’s the comprehensive list of features and functionalities, which make Harrier a truly world-class SUV and primed to take on rivals such as Hyundai Creta, Jeep Compass and Mahindra XUV500. Here’s a detailed test drive report on Tata Harrier to help you make informed decisions. Omega Arc platform: Harrier gets a lot of credibility with its robust and globally relevant Omega Arc platform (Optimal Modular Efficient Global Advanced Architecture). Based on Land Rover’s D8 architecture that’s part of more than 1 million SUVs sold globally, Omega Arc has been developed in collaboration with Jaguar Land Rover. It has undergone the necessary changes to suit Indian driving conditions. Omega Arc ensures superior driving dynamics, owing to its monocoque construction that offers optimized torsional and bending stiffness. Advanced high strength steel and tailor welded blanks have been used, which improve strength and durability, all while reducing Harrier’s weight. Safety has been enhanced with the use of efficiently designed crumple zones. Auxiliary isolation panels and isolated sub-frame design reduce noise and vibrations, ensuring quiet and refined in cabin experience. Harrier is manufactured on an all-new 90%+ automated BIW assembly line that ensures optimal build quality and reliability. It’s easy to trust Harrier, as it has undergone rigorous testing on torturous terrain for more than 2.2 million kms. Take a detailed first look of the new Harrier in video below. Design: Harrier is the first Tata car to get Impact Design 2.0 language that seeks to create the most stylish exteriors and plush interiors that offer optimal comfort and convenience. Harrier has a dominating road presence with its strong proportions and expressive surfaces. The SUV is bound to turn heads on the roads with its muscular bodywork, stylish HID projector headlamps, LED DRLs with turn indicators, flared wheel arches, floating roof with bold chrome finisher, and 3D LED tail lamps with sporty piano black finisher. Interiors feel luxurious and sophisticated with signature oak brown colour scheme and premium oak wood finish dashboard. Harrier has Benecke-Kaliko oak brown perforated leather seat upholstery and door pad inserts. Satin chrome accents have been used at various places such as AC vents, instrument panel, console, door pad inserts and inner door handles. Other key features include soft touch dashboard with anti-reflective ‘Nappa’ grain top layer, leather wrapped steering wheel & gear shift knob, and aero-throttle styled piano black parking brake. Interiors are spacious, offering plenty of legroom and headroom to passengers. 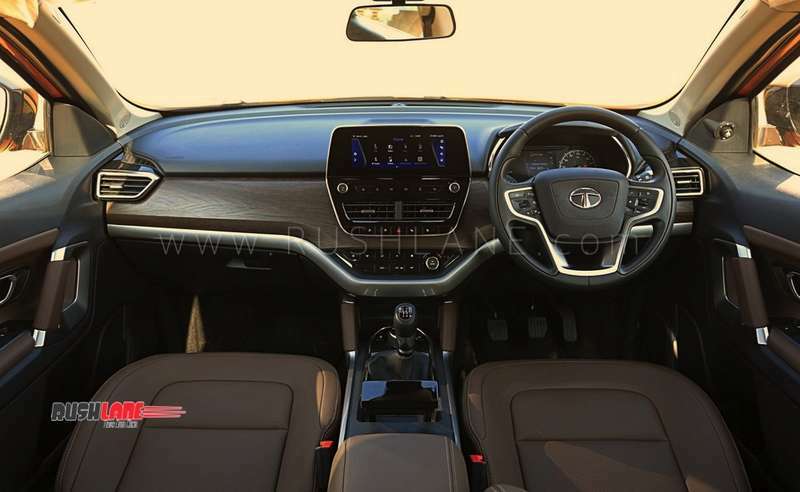 Connectivity & infotainment: Tata Harrier has 8.8-inch HD touchscreen infotainment system that is compatible with Android Auto and Apple CarPlay. Instrument cluster features an analogue speedometer and a 7-inch coloured TFT display. 320W RMS JBL Audio with 9 speakers and external amplifier provides for an immersive experience. Other key features include steering mounted controls, video playback, Bluetooth connectivity, FATC control, ConnectNext App Suite, voice recognition, voice alerts, and SMS readout. Comfort and convenience: Harrier comes with a host of comfort and convenience features to make journeys a lot more pleasurable. There’s cruise control, auto headlamps, rain sensing wipers, electrically adjustable and foldable outside mirror, fully automatic temperature control (FATC) with HVAC, rear AC vents, push button start, 8-way adjustable driver seat, 4-way adjustable co-driver seat, theatre dimming, tilt & telescopic adjustable steering wheel, cooled storage box, intelligently designed storage spaces, power outlets, power windows, and fast charging at front and rear. Dimensions: Harrier measures 4598 mm in length, 1894 mm in width and 1706 mm in height. It has a wheelbase of 2741 mm and ground clearance of 205 mm. Fuel tank capacity is 50 litres. Boot space is 425 litres, which can be extended to 810 litres with rear seats folded. With its big size, Harrier offers more space than any other car in the segment, including the 7 seater XUV500. Engine and Transmission: Tata Harrier utilizes Fiat-soured 1956 cc, 2.0L, 4-cylinider turbocharged diesel engine, which is the same as the one used in Jeep Compass. Rechristened as Kryotec, the engine delivers max power of 140 PS @ 3750 RPM and max torque of 350 Nm @ 1750-2500 RPM. Engine is mated to 6-speed manual transmission. With multi drive modes, the engine can be adjusted to suit specific driving needs. There’s Eco, City and Sport drive modes that are integrated with ESP terrain response modes of Normal, Rough and Wet. This allows the driver to exercise improved control when negotiating tough drive conditions. Other key features of Kryotec engine include cruise control, Advanced Electronically Controlled Variable Geometry Turbocharger (eVGT), lightweight and low friction valve train architecture, and advanced exhaust gas recirculation (EGR) and after treatment system for reducing carbon foot print. Steering and suspension: Harrier has hydraulic power assisted rack and pinion steering. It has been tuned to give a good steering feel and to ensure excellent driving dynamics. Front suspension comprises independent, lower wishbone, McPherson Strut with coil spring and anti-roll bar. This is largely the same suspension system used in Discovery Sport. Rear suspension comprises semi-independent twist blade with Panhard Rod and coil spring. Rear suspension has been designed and tuned by UK-based Lotus Engineering to suit Indian driving conditions. Brakes: Harrier has disc brakes at the front and drum brakes at the rear. ABS with EBD and ESP are offered as standard. Safety & security features: Tata Harrier comes with a long list of safety & security features. Key among them are 6 airbags, electronic stability program (ESP), ABS with EBD, corner stability control, off road ABS, electronic traction control, electronic stability control, hill hold control, hill descent control, roll over mitigation, brake disc wiping, electronic brake pre-fill, hydraulic brake assist, hydraulic fading compensation, dynamic wheel torque by brake, ISOFIX child mounts, fog lamp with cornering function, perimetric alarm system, driver and front passenger seat belt reminder, reverse parking camera, remote central locking, speed sensing auto door lock, immobilizer, and child locks. Driving Dynamics? While the Harrier has left us all impressed from the outside as well as the inside, as they say “proof of the pudding is in eating it”, the real deal of the Harrier is in driving it! The Harrier had so much anticipation built up, hopes raised with its impressive tech specs tumbling out every now and then that we couldn’t wait for the opportunity to get behind it’s wheel. Let’s start with the good bits first, ohh wait, are there any bad bits as well? Nah! Not really, but certainly could be better bits on the Harrier which we will talk about later. Now, we have come to know that the Harrier shares its engine and drive train with the Jeep Compass, the gear ratios are bespoke, tweaked and tuned complement Harrier’s kerb weight, driving dynamics, its ESP (Electronic Stability Program) and its 14 spin-off driving aides. The 2.0 litre oil burner punches out 140 PS @ 3750 rpm and 350 Nm @ 1750-2500 rpm with the helping of an electronically controlled Variable Geometry Turbocharger. Harrier comes equipped with Multi Drive Modes 2.0 (Eco, City, Sport) which essentially are engine maps and pretty self-explanatory. Tata Harrier remains in the City mode as a default and the Eco modes blunts the throttle response significantly. The Sport mode gives the Harrier a serious spring in its step and once experienced, there is simply no going back to other modes. It’s worth noting that the Harrier returns respectable fuel economy numbers even in the Sport mode when driven judiciously. The engine spins eagerly and gets a quite vocal at high revs but does so without sounding too harsh. As mentioned earlier, the gear box ratios have been tailored to suit the Harrier’s driving characteristics. The ratios are well spaced and seem to be biased more on the higher side giving the Harrier a long-legged feel on the highways. The engine spins at a meagre 1500 rpm @ 80 kmph, 1750 rpm @ 100 kmph, 2250 rpm @ 120 kmph and 2500 rpm @ 140 kmph (all in 6th gear). It’s no surprise that the Harrier accelerates briskly even at triple digit speeds, while it pulls cleanly in 6th gear from as low as 60 kmph without bogging down a bit. The 6-speed Manual transmission has a positive shift action through its well defined gates and is a big improvement over any other cars from the Tata badge, the clutch pedal although light in effort, has a slightly longer travel for our liking. Another trick that adorns the Harrier capabilities is the Terrain Response Modes (Normal, Rough, Wet). We know what you are thinking, and so did we. What the heck are these drive modes doing on a SUV that’s not even AWD/4WD (Yet). Well, when we drove around the fringes of the Khimsar Dunes Village, the Rough mode helped in crawling around at 10 kmph without even a prod at the throttle, it simply tames rough terrain with ease. The Harrier impressed us not only off road, but also with its immense composure on road too. The Steering feel and feedback is highly instrumental in the whole driving experience in any vehicle and the setup on the Harrier is nothing short of chatty. The Harrier employs Hydraulic steering with power assist with a fast rack that gives it a very direct feel. The steering isn’t as light as its Electronic counter parts at parking parking speeds, but feels supremely communicative as the speeds build up. It responds promptly to slightest inputs to the thick rimmed newly designed steering wheel which itself is nice to hold. The Harrier is the first ever Tata vehicle to sport the monocoque chassis with the underpinnings of the fabled D8 architecture from Land Rover. What it means is, that the Harrier mirrors the platform and suspension bits to the Land Rover Discovery Sport and the erstwhile Freelander 2. The platform with Tata’s clever and cost effective manufacturing techniques have helped to deliver this proven technology at a competitive price. Monocoque chassis directly translates into weight savings over a Body on Ladder construction while improving the driving dynamics of the car. The Harrier is a result of 22 lakh kms worth testing and tuning and its suspension setup is a clear testament of the same. Full marks to Tata for nailing this on a new platform at the first go. When it comes to handling, the Harrier handles unlike any of its competition can even think of. Despite a tall 205mm ground clearance and relatively high centre of gravity, tyres with high aspect ratio and long travel suspension, the Harrier virtually defies the laws of physics. All the mentioned factors, actually work in the favour of the Harrier giving it a fine balance between firm and comfort tune of suspension. The Harrier does not bob around on undulations and the Panhard rod setup at the rear improves the lateral stability. Potholes and broken patches are dealt with aplomb while, the now mandatory speeding warning is the only indicator that the Harrier is cruising over 120kmph without exhibiting any nervousness that is usually associated with SUVs at high speeds. The Harrier sports a disc at the front and drums at the rear braking setup and upon asking – the Tata engineers confidently replied that the Harrier doesn’t need Discs at the rear. The brakes with Disc Wiping function (only on XZ trim) bestows it with some serious stopping power without any pitching or nose diving even under hard braking. Although no braking setup is ever perfect with always a room for improvement, we have to agree that the current setup is potent enough and discs at the rear are not missed at all. What’s not to like: Modern day diesel’s are setting new benchmarks in lowering NVH levels and the FCA sourced 2.0 litre Kryotec engine isn’t the quietest one for sure. The Harrier eggs one to drive it enthusiastically and although the engine sounds a harsh when revved hard, especially when seated at the front. The occupants at the back seat are less affected. That said, the NVH levels at the front aren’t bothersome by any standards if the car is driven sedately. The Kryotec driveline employs a DMF (Dual Mass Flywheel) and at low speeds in stop and go traffic tends to emit a feeble clunking sound at on/off throttle applications which is hard to ignore once noticed. While the gear ratios are on the taller side and best suited for relaxed high speed cruising, the engine may cut off abruptly at low speeds, shifting in to 1st gear to traverse over speed breakers is needed. Summing it up: It is clear that the Harrier is a driver’s car – period. It was a pleasant surprise and a revelation behind the wheel and the development engineers at Tata seem to have nearly nailed it on the head when it comes to driving dynamics and ride comfort. The Tata Harrier is a brilliant package and is engaging to drive with handling characteristics which are not expected from a car of it’s footprint. What’s more, the OmegaArc is a modular platform, 4WD ready and the current version in it’s top trim is already loaded with electronic wizardry which is often seen on AWD/4WD cars – get the drift? Kitna deti hai, you ask? During our enthusiastic jaunt, the real time FE dropped to about 11 kmpl. While driven sanely around 80-90, the Harrier’s MID read 18.5+ kmpl. Expect it to deliver around 13-14 kmpl with mix of Highway and City traffic conditions. 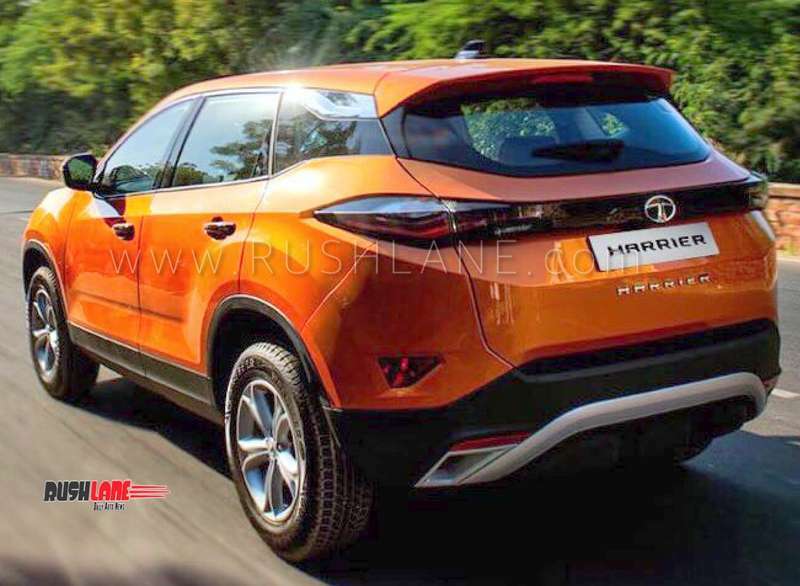 Should you buy Tata Harrier? Tata Harrier has JLR’s legendary pedigree, stylish exteriors, luxurious and spacious interiors, powerful engine, advanced technology integrations and some of the best safety and security features. It offers superior performance and durability. However, there are minor issues like the plastic quality in some places is not on par with the overall quality of the car, fit and finish is not consistent in some places, missing features like automatic transmission, petrol option, sunroof and AWD / 4×4. Competition is tough and unless a new car offers more value than existing rivals, it will be a challenge to remain relevant in the market. Nevertheless, this is not only the best Tata car, but is also the best driver’s car made by any Indian car maker till date.